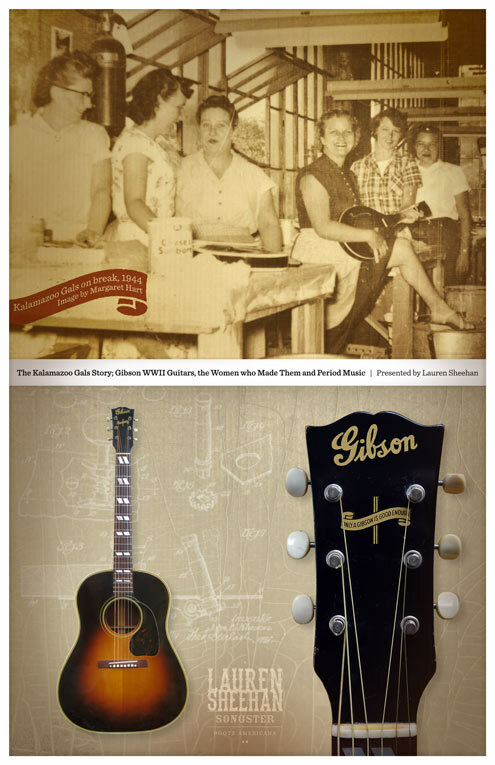 While the men were off to WWII, women stepped in, keeping the lights burning at Gibson and other factories around the United States. While most of the manufacturing was for war supplies, some other products were still produced, including Gibson “ Banner Guitars”. Only guitars made in this period have the iconic decorative banner across the headstock and are oft considered treasures of the Gibson lineage. But who were the women, what was their story, why did Gibson cover up the fact that they made these guitars, why are the guitars so wonderful sounding and how were they made? 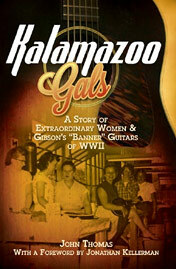 These questions and more about the story are the subject of the book, “ Kalamazoo Gals: A Story of Extraordinary Women and Gibson WWII Banner Guitars, by John Thomas. John also wanted readers to be able to hear these beautiful sounding instruments, so he raised some funds to make a companion CD for his book. He got guitars donated from all over the country for the recording project and then found a women guitarist to play them - Lauren Sheehan. 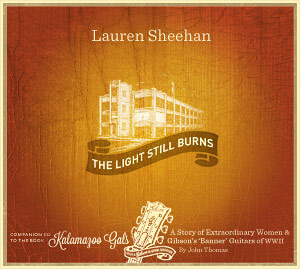 Many period songs seemed to suggest themselves to Lauren, who has been studying American folk music since 1975, and the CD, The Light Still Burns, is full of music that regular folks would have known and played in homes, parlors, on porches and in dancehalls across the country in the 1940’s. There is a different banner guitar on each track and Eric Tate, recording engineer, masterfully captured the nuances of each one of them at Firehouse 12, New Haven, CT.
» March 19, 2013 | Oregonian Story, "Portland's Lauren Sheehan salutes 'Kalamazoo Gals' with the guitars they built"